Hannah Genders looks forward to work on an exciting commission. I ’m sure that, like me, you find that every now and again a job or project comes along that seems such a good fit it would appear to have your name on it. I have this feeling about a new project I have just started in Portishead near Bristol – I’ll try and describe why I think it fits so well with what I love to do. The site is about six acres in total and sits on a hillside overlooking the Bristol channel, so on a good day it’s very possible to see the Welsh hills over the other side. There is a house on the site at the moment but the owners’ plan is to rebuild this as an eco house, a very exciting prospect as you currently enter the house at one level but come out of the back off the ground at what’s best described as tree canopy level. Add to this the stunning view out to the channel and you begin to get a feel of what could be achieved. The architects have been approved for the project so I’m looking forward to working with them in the near future. I have to say, though, that it is the outlying landscape project which has got me very fired up. There are about two to three acres of woodland, all very overgrown and needing clearing, which we have started to do this winter. We are removing all the conifers and replanting with oak and sweet chestnut, with a second storey of hazel which will be coppiced on a regular basis. We’ll then plant lots of bluebells and wood anemones under the hazel to create a carpet of naturalised flowers in the spring. 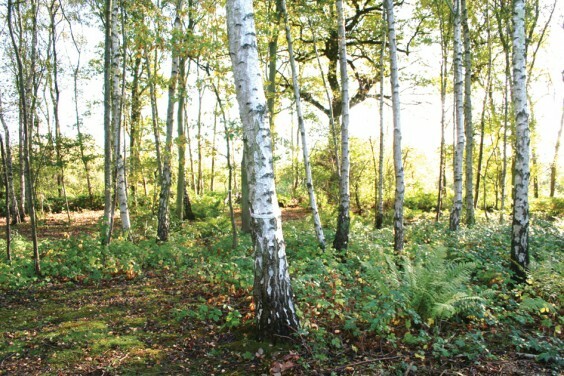 The other area of woodland is silver birch – again the trees have been crowded out with conifers so we’ll take these out and replant with the native silver birch or Betula pendula, creating a different type of woodland with a lighter feel in this area. All of the woodland forms part of a designated wildlife site, so part of the project is to build bird and bat boxes to encourage more wildlife to stay. Above the woodland is a large stand of mature beech trees, and as the clients have a young daughter and plan to have lots of her friends around, we are hoping to make this a natural playground area with dens and games through the woods. The middle of the site is divided by a spring-fed stream and two natural pools, in need of excavation to get it all working well again. The lower pool in particular is very overgrown with bull rushes and needs clearing out, and the big problem we have here is that the very invasive Japanese knotweed has taken a hold. This plant is one of the worst in the country and will need to be burnt out until it has completely gone; even a thumbnail size piece of root will reshoot if dropped on the ground and it is so bad that it can lift tarmac and paving once it gets growing. On from the pools is a path leading down to a little beach, but this is currently so overgrown that you can’t get anywhere along it. Again, the idea is to clear the bramble and invasive weeds, then replant with native shrubs for food and nectar for birds and insects – plants such as Ulex europaeus (gorse), Cytisus scoparius (broom), Hippophae rhamnoides (sea buckthorn) and the native roses Rosa rugosa and Rosa spinosissima. And there’s more! Just below the house is a paddock, again very overgrown with bracken but once we have cleared it back we plan to replant native wild flowers and create a meadow. By using the local farmer’s cattle to lightly graze the field, we should be able to set up a good regime that ensures the wildflowers thrive here. The wildflowers need to be site-specific for this shallow limestone soil, able to withstand salty winds from the estuary – plants such as birdsfoot trefoil, common vetch, meadow cranesbill, and ox-eye daisy. There is a small area of flat land near the tennis court and I’d like to see this reinstated as an orchard and lawn, then once the house design is in place all the ornamental gardens around the building will need designing and eventually constructing and planting. You wouldn’t really think this project could get much better, but added to all the above is the client’s objective to use the place as a retreat for family friends and also for contacts they have in Africa, so even the therapeutic benefits of the landscape come into play. All in all, from the wildlife to the woodland and natural play, this really does contain every aspect of an exciting and inspiring project. I’ll keep you posted as the whole site begins to take shape during the year.